Teryn Scott is known for her athletic ability as a member of the nationally ranked Lady Tiger volleyball team. The talented sophomore will also now be known for her academic prowess after being named the Cowley College April Student of the Month. Teryn is the daughter of Kim and Todd Scott of Kansas City, MO, and the granddaughter of January Scott of Topeka. The pre-nursing major has one brother, Trevor 13. Prior to coming to Cowley, Scott attended Platte County High School where she participated in volleyball, soccer, basketball, choir, honor choir, newspaper, and the National Honor Society. She came to Cowley to play volleyball and has flourished as a student-athlete. Scott led the nation in digs per set (7.09) as a sophomore and finished the 2016 season with a total of 821 digs and 50 service aces. Her stellar play helped the 2016 Lady Tiger volleyball team capture a share of the Jayhawk Conference Eastern Division title and finish with a record of 25-9 on the season. Scott was named a First Team All-Conference and All-Region selection as well as an Honorable Mention All-American and finished her Cowley career with 1,213 digs. Along with playing volleyball at Cowley, Scott also serves as a Student Ambassador and is involved in the college’s Phi Theta Kappa program. She is a member of the Dean’s Honor Roll, has a 3.67 GPA, and was named Cowley’s Athlete of the Month in November, 2016. 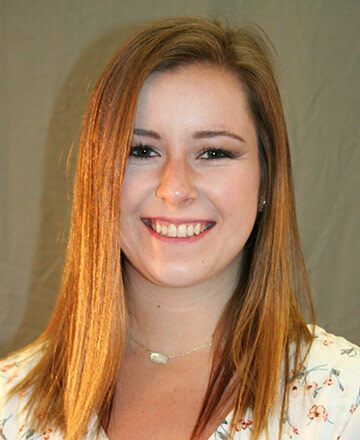 “Teryn is an excellent student that demonstrates academic leadership in the classroom,” Cowley Natural Science Department Chair Dr. Michelle Schoon said. Away from Cowley she volunteers at the Cowley County Humane Society, the Calvary Chapel, and youth volleyball camps. Scott was shocked to learn she was named the April Student of the Month. “There are so many great students here that it is an honor to be named Student of the Month,” Scott said. Scott signed a letter of intent in November to continue playing volleyball at NCAA Division II school Missouri Southern State University.